I found this novel hard going at first. A lot of characters and scenarios came racing at me thick and fast. The structure is unusual too, with small snippets, mini chapters if you will, headed by a time and location. However, once I’d settled into it and gotten used to the style I started to enjoy the book. Piece by piece Litten builds up the story and it seems every new page added another piece to the jigsaw. The author's observations were spot on. He brings humour, pithy observation about life and a very diverse range of characters. The novel is set in Hull and written in the local dialogue. For those outside of Hull this won't spoil your enjoyment even if it does take you a little while to get used to it. The events in the book take place during the annual Hull fair week when a huge travelling fair comes to the city every October. This is a major event in the local calendar and everyone in the city feels they have to visit the fair at least once. Litten uses this local sense of excitement and anticipation to great effect within the story. Litten scores points not only for his excellent characterisation but also for his talent for creating just the right atmosphere. His descriptive writing is also top notch. I started this novel feeling a little bemused and finished it having enjoyed it thoroughly and admiring the talents of Russ Litten. A must read for most folk. A mandatory read for the folk of 'Ull! 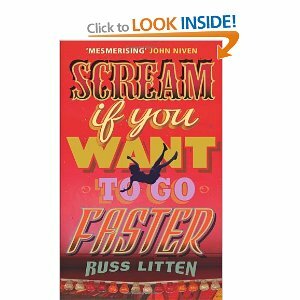 Russ Litten could well be Hull’s answer to Irvine Welsh.